I had the good fortune to be studying and writing on the Indian economy as it was reforming, opening out, and coming into its own. A time of flux is a great teacher, especially if you are present at ground zero. Slowly, analytical frameworks were refined to context. These led to a rich set of writings—academic, policy and popular, and a book on open economy macro. Awards and honours followed, but the most valuable was being able to learn and to contribute. 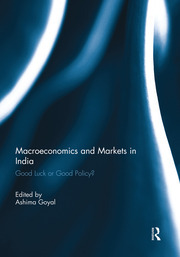 Professor at the Indira Gandhi Institute of Development Research, Mumbai, India, Ashima Goyal, is widely published in institutional and open economy macroeconomics, international finance and governance and has provided consultancy to ADB, DEA, GDN, UNDP, RBI, UN ESCAP and WB. She is the author of a book on Developing Economy Macroeconomics (Allied, New Delhi, 1999), and editor of Macroeconomics and Markets in India: Good luck or good policy? (Routledge- UK, 2012), Handbook of the Indian Economy in the 21st Century: Understanding the Inherent Dynamism (OUP- India, 2014), and a History of Monetary Policy in India since Independence (Springer-India 2014). She also edits the Routledge journal Macroeconomics and Finance in Emerging Market Economies. She is active in the Indian policy debate, contributes op-ed columns, and has served on several government committees, boards of educational and of financial institutions. She was a member of the Central Bank’s Technical Advisory Committee and is Chairperson at MSEI stock exchange. She was a visiting fellow at the Economic Growth Centre, Yale University, USA, and a Fulbright Senior Research Fellow at Claremont Graduate University, USA. Her research has received national and international awards.